"Questionable decision making" and doctors working "outside their competence" at a hospital's spinal unit has been criticised in a review. Spinal surgery was suspended at Warrington Hospital after four serious "incidents" in which two patients died. An independent review commissioned after the suspension, in 2017, was seen by the BBC following a request under the Freedom of Information Act. 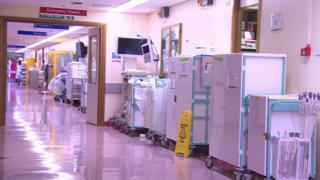 The Cheshire hospital said the report would be "fully considered". Warrington & Halton Hospitals NHS Foundation Trust medical director Professor Simon Constable, said: "We once again offer our sincere apologies to all those patients and families that have been affected either by the serious incidents or by the disruption to services arising from the service suspension." The trust said the two deaths had been caused by "medical complications" rather than as a direct result of surgery. The review by the Royal College of Surgeons was commissioned by the trust in 2017. "Insufficient senior consultant oversight of some complex surgical procedures"
The review also said the unit had failed to implement recommendations from a previous report prompted by concerns in 2014. A number of specific findings in relation to the serious incidents have been redacted by the trust. The review team also found there was "very little trust" between the hospital trust and Warrington's clinical commissioning group, which allocates NHS funding. Their report said "a very tense situation had evolved" after the trust announced its intention to resume some spinal surgery. Spinal surgery in Warrington is still suspended and the review said it should not resume until the "patient-safety issues" it highlighted were addressed. The review also suggested the unit should partner with another unit elsewhere to "provide strong oversight at all stages of the patient pathway". Prof Steven Broomhead, chair of Warrington's Health and Wellbeing Board, said: "I have concerns around the patient safety aspects and concerns that improvement steps which were agreed don't seem to have been fully implemented. "It's not clear from a patient safety point of view and in terms of spinal injury treatment what the plans are for the future." But Prof Constable said the review's recommendations would be incorporated into plans that were being put together for the future of spinal surgery across Cheshire and Merseyside. "This will include defining the role of Warrington and Halton Hospitals in keeping access for patients to spinal surgery services as close to home as possible," he said. "Alternative providers remain in place to take Warrington and Halton patient referrals for the immediate future."